Adam and Eve Magic Massager, 110 Volt ultra powerful soft ball head electric massager with E-Z bend neck flexible massage action hits all the right spots. Customize your massage experience. Hi-torque motor with 2 speeds. Soft massage head for total comfort. Specifications: super strong dual speeds. Long handle for easy use. Electric power cord measures 5.5 feet long. Flexible ball spring head. Plug into common electrical outlet. Power never runs low. The massager has a quiet motor for discreet operation. Made using phthalate free, non-toxic materials: Thermoplastic Rubber TPR massage head, ABS plastic handle. 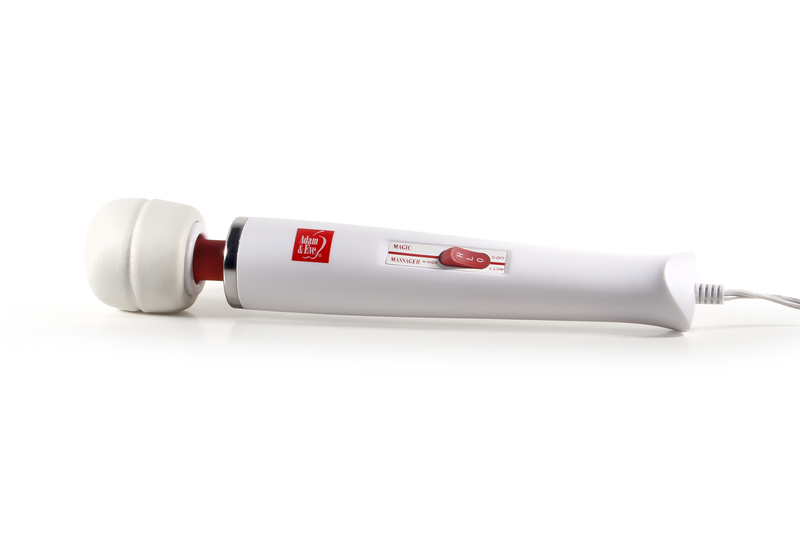 Magic Wand Massager measures 12 inches long by 2.25 inches wide. EZ Bend head. External massage only. After use, simply switch the unit off, unplug, and wipe the tip off thoroughly with a damp cloth before storage. Adam and Eve Signature Toys from Evolved Novelties.